Founded in 1892, Cambuslang has played a full part in the history of golf in Scotland over many years. We are still probably unique in having not one but two ex-Scottish champions amongst our members, our late President John S. Montgomerie who won at Royal Aberdeen in 1957 and Craig Everett who won at Gullane in 1990. Situated just south-east of Glasgow, Cambuslang offers a pleasant golfing experience, in gently rolling, tree-lined surroundings with the River Clyde flowing close by the northern boundary of the club. The opening of the new extension of the M74 motorway has brought the club within easy access of Glasgow (15 minutes from the City Centre) and surrounding areas, exiting at junction 2A Southbound. Visitors are always welcome at Cambuslang. Please view our Visitors page for more details of playing times and green fees. 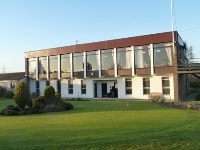 If you are thinking of joining a golf club, visit our Membership page to find out what Cambuslang Golf Club has to offer and the benefits of becoming a member of a local, friendly club.